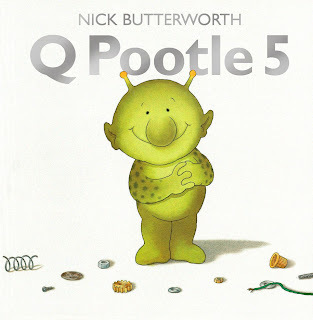 Giveaway - Win with Q Pootle 5, the New cBeebies Show! You may have seen a new show being advertised on cBeebies this week, Q Pootle 5 launches on Monday 27th July at 8:15am and I know my little boy, for one, is very excited about it. The new space-themed show tells the story of Q Pootle 5 and his friends - Oopsy, Eddi, Stella, Ray, Groobie, Bud-D and Planet Dave - as they make sense of their lives on the little planet of Okidoki. With friendship at the heart, funny and engaging stories and rich and nuanced stories, Q Pootle 5 makes space a fun place to be. There's also some cracking voice talent to be heard with Ed Gaughan (Bunnytown, Black Mirror); Joanna Page (Gavin & Stacey, Poppy Cat); Steven Kynman (Thomas & Friends, Fireman Sam); Richard Ridings (Peppa Pig); and Ella Kenion (Cuckoo, The Hive, Swashbuckle) all lending their voices to the various characters. You can see a video clip introducing all the characters here. Q Pootle 5 is based on a story book written and illustrated by the amazing Nick Butterworth and, to celebrate the launch, I have two copies of the book to give away.